I started working on the Outcome learning idea to give direction to the product development of easygenerator. And it did generate a whole bunch of new features, but the impact was different than expected. We always considered the e-Learning author and the subject matter expert (SME) as our target audience. But now we added features that had an impact on the learner and for the first time we had to develop features for them. This proved to be a big change. I will try to explain this impact in this post. We started to develop based on this concept in the beginning of the year. First we created all kind of features that would enable SME’s to play a bigger role in development process. So we created a role based system, workflow facilities and more features like that. To bring learning closer to the workplace we added mobile publications, a QTI export and a facility to reuse content in a smart way. These are all features that were ‘close to home’ for us. But in the version that we are developing at this moment that has changed. Make it possible to create courses that really adapt to the learner and put the learner in control of his individual learning. The first two goals led to functionality that affects the author. We created to possibility to define learning objectives, developed a dashboard to support course design based on these objectives, made it possible to connect questions and assessments to the objectives and an option to create a study advice based on the outcome of these assessments. They are all features that we are really proud of, but they are still aimed at the author. This changed when we started to think on how to bring these new features to the learner. We needed to create an option to present a study advice based on the results of assessments and connected to the learning objectives. The goal was after all to create adaptive courses with true individual learning paths. Easygenerator works with so-called master pages; they define the look and feel of a course and the functionality of the course. And before we realized it we were developing master pages with all kind of extra features for the learner. We created a smart table of contents and a study advice control. We started to realize that our output is not a system to create e-Learning courses, but the courses and the learning experience they offer. Up till now you could not really tell that a course was created with easygenerator or another tool, but now you can. The course itself has unique features and they really impact the way a learner will work with these courses. From the outside this might seem as a logical step, but for us it is a big change. We are changing from a company that develops software for e-Learning into a ‘learning company’ that develops an authoring platform. Software is not the goal, but it has become a means to create and change e-Learning. Our complete focus is shifting. As a consequence of this we just hired our first e-Learning consultant and more changes will follow. The funny thing is that this is something I wrote down in our mission statement, but without actually steering in that direction this change just took place. So we as a company have to adept in order to create adaptive learning. 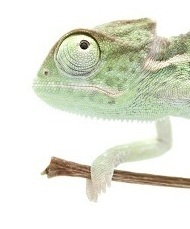 This is part of the reasons we chose a chameleon as part of our corporate image, they can adept as no one else. The only thing might be that we chose the wrong image, it is very possible that it is a Lizard. But we really got used to our green friend, so we will stick with him, being a Chameleon or as a Lizard portraying to be one.